100 World Story (the English name) is a boardgame/RPG hybrid. There are 4 characters, controller by players, AI, or some combination thereof. You can work together with the other players or you can fight against them. The goal is to get better equipment and gain experience, primarily through fighting monsters and doing quests. There are 3 different game types each with a different end goal (such as defeating a dragon terrorizing the kingdom). 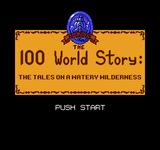 100 World Story is the predecessor to Dokapon Kingdom.